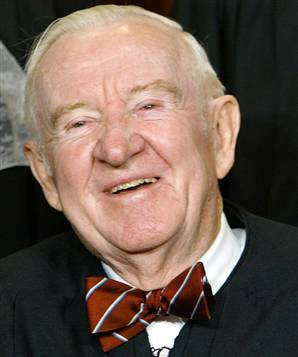 There is absolutely no good reason why replacing John Paul Stevens on the Supreme Court should generate a fight with Republicans. The court currently has a conservative majority and replacing Stevens, who is considered to be the leader of the liberal wing, with another liberal would not shift the balance on the court one iota. And yet, Republicans are already talking about filibustering any nominee put forward by President Obama, unless, I assume, he were to pre-approve his choice with Republicans first. As the minority party that lost the last two elections, Republicans are in no position to be dictating to Obama who his Supreme Court pick can or cannot be. But it shouldn’t matter, because as I noted, he can’t change the makeup of the court with this pick regardless. Unless, of course, he were to pick a more moderate replacement and thus make the court that much more conservative than it already is. It should be no surprise that Stevens has decided to step down. He is by far the oldest justice on the court at (nearly) 90, and as a liberal, one would assume he would want a Democratic president to choose his replacement (even though, oddly enough, he was appointed by a Republican - Gerald Ford). The next most likely justice to step down is yet another liberal, Ruth Bader Ginsberg, who is the second oldest justice at 77 and has had health problems recently. So, concievably, Obama could make three Supreme Court selections during his first term without altering the ideological makeup of the court one bit. His first choice of Sonia Sotomayor replaced liberal justice David Souter. The only way the balance on the court could shift would be if one of the older conservative justices - Antonin Scalia (74) or Anthony Kennedy (73), both Reagan appointees - were to suddenly experience health problems and step down unwillingly. Then one might expect a fight as the ideological balance of the court would be at stake. But as it is, things are not likely to change even though Republicans are promising to put up a fight as if they were. Last time I guessed correctly that Obama was going to choose Sotomayor. This time I have no clue, but I am betting he will pick another woman - possibly Elena Kagan or Diane Wood.